Regarding building the Church, the Pope said one must first of all know that Jesus Christ is its foundation. The Pope said, “He is the corner stone of this building,” and “without Jesus Christ there is no Church.” A Church without foundation will just collapse, he warned. A Church without a living Jesus will come down. He further explained that "we are the living stones" of this Church. All are not same but each one is different, and this, the Pope stressed, is the wealth of the Church. Each one of us builds according to the gift God has given us, he said, adding, a uniform Church is not a Church. Speaking about safeguarding the Church, the Pope said it means being aware of the Holy Spirit who is in us. The Pope lamented that many Christians know Jesus Christ and the Father because they pray the “Our Father”. But speak to them about the Holy Spirit, and He is associated with a dove and nothing more. But the Pope insisted that the Holy Spirit is the life of the Church and He is your and my life. We, the temple of the Holy Spirit, he said, must safeguard Him as St. Paul urges Christians not to “sadden the Holy Spirit”, i.e. not to go against the harmony that the Holy Spirit creates in us and in the Church. He is harmony, and He creates harmony in the building. 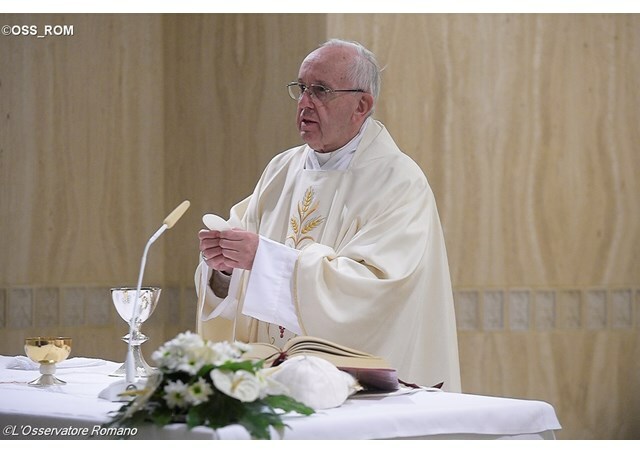 Finally, regarding the task of "purifying the Church," the Holy Father said, it begins with us. For this, he said, all need to recognized our sinfulness. Anyone claiming not be a sinner would be a good curiosity, he said. Since we all are sinners, we need to purify ourselves continuously. This in turn purifies the community, the diocesan community, the Christian community and the universal community of the Church. This is what makes the Church grow, the Pope said.